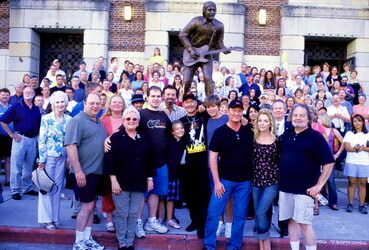 On August 21, 2005, James’s 66th birthday, a statue honoring him was unveiled in front of the Municipal Auditorium in Shreveport, Louisiana. Fans from all over donated money. The statue stands next to the statue there of Elvis. 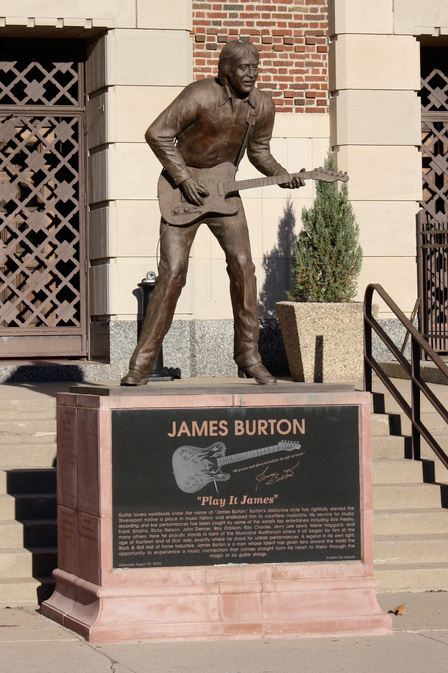 Guitar players worldwide know the name of “James Burton”. Burton’s distinctive style has rightfully earned the Shreveport native a place in music history and endeared him to countless musicians. His service for studio recordings and live performances has been sought by some of the world’s top entertainers including Elvis Presley, Frank Sinatra, Ricky Nelson, John Denver, Roy Orbison, Ray Charles, Jerry Lee Lewis, Merle Haggard and many others. Here he proudly stands in front of the Municipal Auditorium where it all began for him at the age of fourteen and at Elvis’ side, exactly where he stood for untold performances. A legend in his own right, Rock & Roll Hall of Fame inductee, James Burton is a man whose talent has given fans around the world the opportunity to experience a music connection that comes straight from his heart to theirs though the magic of six guitar strings.